Visit the Insurgency: Sandstorm website featuring a few more trailers, screenshots and community links. NVIDIA today released the latest version of their driver suite, which aims to bring users’ systems up to scratch towards playing the latest games with as much performance and stability as possible. The new 391.01 version of NVIDIA’s driver suite brings GameReady improvements that pave the way towards Final Fantasy XV – Windows Edition’s release. This driver release packs a bigger punch than just Final Fantasy XV, though; it’s also a Game Ready driver release for the upcoming Warhammer: Vermintide 2, and for the upcoming World of Tanks’ graphics engine upgrade, which will bring tons of graphics features, updates and improvements to the base World of Tanks experience. You can download the new GeForce 391.01 Game Ready Drivers from GeForce Experience and GeForce.com. AMD had released the latest version of Radeon Software Adrenalin Edition. Version 18.2.3, the third release for this month, comes with optimization for “Final Fantasy XII The Zodiac Age,” “Sea of Thieves,” and “Brass Tactics.” With “Sea of Thieves,” the drivers enable up to 29% higher frame-rates at 4K UHD, when measured with Radeon RX Vega 64, and up to 39% higher frame-rates at 1080p, when measured with an RX 580. With FFXII, it enables up to 13% higher frame-rates at 1440p measured with an RX Vega 64, and up to 20% higher frame-rates at 1080p, with an RX 580. A host of FreeSync-related bugs are addressed with this release. They correct a bug experienced with FreeSync kicking in during online video-playback in Google Chrome, causing flickering; rapid frame-rate changes between minimum and maximum FPS ranges when gaming in certain system configurations; which causes stuttering; and a flickering observed on FreeSync-capable displays when performance metrics overlay is enabled with Enhanced Sync. A Radeon Overlay flickering noticed on Vulkan API games was fixed. A display corruption issue with “Fortnite” was fixed. The new Radeon Software Adrenalin 18.2.3 Beta drivers are available online at the AMD driver download page. 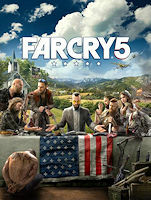 Ubisoft’s Far Cry 5, the upcoming first-person shooter will take players to Hope County, a fictional county in rural Montana that is overrun by a fanatical cult. In this article we will discuss the Far Cry 5 Release Date, Campaign and Gameplay. For further details on The Cult, Vehicles, Guns for Hire and Season Pass, find details on gamingintel.com. Far Cry 5 will give players a massive open world to explore, full of realistic NPCs, tons of activities, and an insane cult to dismantle. The game was initially scheduled for a February release, but was delayed to March 27, and will be available on PlayStation 4, Xbox One, and PC. Along with the new melee ability, Far Cry 5 introduces many new or refined ideas and mechanics into the series. Most notably is the Resistance Meter. Each region has a unique Resistance Meter that delivers feedback about the player’s effects on that region and its Herald. The more the player disrupts the cult activity in that region, the more the meter will fill. Once that region’s meter reaches its max, the player will have a showdown with the Herald of that region. Because of the way the Resistance Meter works, Far Cry 5 has a non-linear campaign. This means that whether you’re playing alone or with an ally, the campaign can be played in whatever order you’d like. And, whenever you feel like taking a break from the campaign, there’s no shortage of ways to spend your time. Hope County is full of recreational activities like hunting, fishing, or wingsuit gliding. The crafting system returns from previous installments and goes hand-in-hand with hunting and fishing. One of the largest changes to the Far Cry formula is the intel system. Much to my disappointment, climbing to the top of towers is no longer the way of learning new information and unlocking the map. Instead, players will gain intel in a much more organic way, by exploring and talking with people. Tom Clancy’s Rainbow Six: Siege Operation Chimera is officially deployed on the Test Server until March 2nd. Interested players can join exclusively on PC. The Test Server is an alternative version of Tom Clancy’s Rainbow Six: Siege. The Test Server allows players to test upcoming gameplay features that will make their way into the main game itself. A consistent gameplay experience is not guaranteed on the Test Server. Operation Chimera introduces two all new operators to the multiplayer roster, Lion and Finka, Elite members of the Chemical, Biological, Radiological, Nuclear (CBRN) Threat Unit. Additionally, Lion and Finka represent French and Russian counter-terrorism units, respectively, as biohazard specialists. Along with traditional, competitive Rainbow Six: Siege multiplayer matches, these new Operators will see their weapons and gadgets put into action in Outbreak, a new four-week co-op event that starts March 6th. The limited-time Outbreak event will be made available periodically throughout the Test Server phase starting on February 20th, allowing the development team time to improve and implement fixes as necessary. To get all the latest news on Rainbow Six: Siege, please visit www.rainbow6.com. A closer look at these four factions can be seen in the Desert Kingdoms Announcement Trailer HERE. Desert Kingdoms is available for 10% off until its release day on 8th of March on Steam.